This is WinBrowser's main window. You can change the column size and number of columns to make yourself comfortable. You can also set the sort order, detail level, and folder grouping to suit your needs. WinBrowser also allows you to rename, resize, and add as many Shelves as you like so you can bookmark and organize your favorite files and folders. With WinBrowser's Preview you can easily view the currently selected image, multimedia, text, PDF* or web page file. 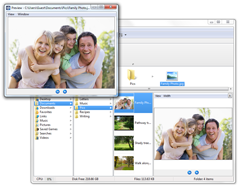 Just select a file and it is automatically displayed in an external Preview window, the last browser column, or both. *PDF file viewer available in 32-bit version only. Multimedia Preview has a few special features of its own. You can watch video and listen to audio right in WinBrowser. In addition, WinBrowser allows you to autoplay a file upon selection or to play all items in a folder in order without pausing. 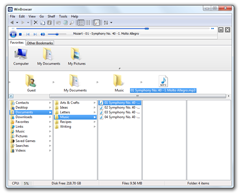 When you want to navigate to another folder but you don't want the music to end, WinBrowser can put the Media player into a toolbar which can be restored to the Browser columns at any time. See the second screen shot for an example. For the musicians out there, WinBrowser not only plays all items in a folder one after the other, but it allows you to set a delay time between each item played. This is perfect for when you're searching through a list of sample sounds trying to find one that's just right. WinBrowser performs each file operation (file copy, move, cut/copy/paste, delete, etc.) in it's own separate execution thread so you can have as many as you want going on at once without ever having to wait for one to complete before starting something new. Save lots of time renaming similar items by renaming them all at once using WinBrowser's multi-file rename feature. When you want to change the default application that opens a file of a certain type, WinBrowser makes it easy. 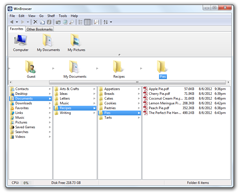 File extensions are in the left-hand scroll list and file types are on the right. 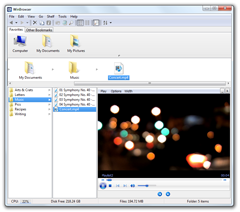 Both file extensions and file types are fully editable.